Four Rivers Photo: Blog -- Technical tips, shooting locations and photographic opportunities in the Annapolis area. Learn to use your camera's histogram to achieve the exposure you want, even when shooting in A/Av, S/Tv and P modes, control your camera's suggested settings using exposure compensation. Late October photography opportunities in and around Annapolis, Maryland from your friends at Four Rivers Photo Workshops. Late summer photo opportunities near Annapolis, Maryland from Four Rivers Photo Workshops. Use these well known tips to catch great photos of our LAST 2015 snow and the waxing winter moon. Sign up today so you have plenty of time to take our pre-workshop self-assessment. It's quick. It's painless and it really helps you focus on those areas where you want coaching. We and our participants have been very pleased with the results. We think you will be too! Come join us. Bicentennial Celebration - What are you shooting this week? 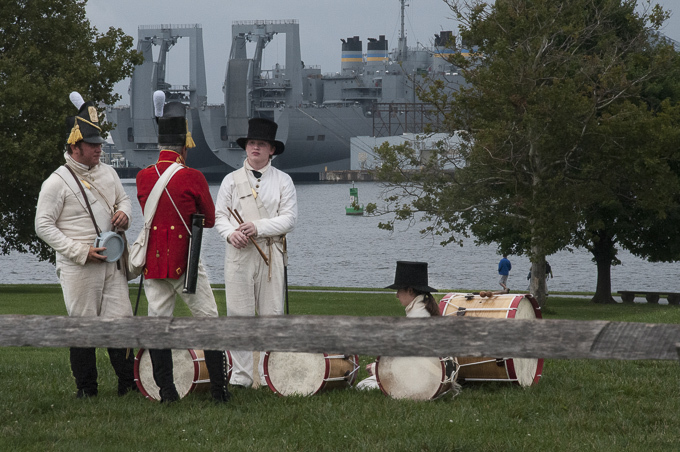 The two year commemoration of the events surrounding the War of 1812, the Battle of Baltimore - Defense of Fort McHenry and the Star-spangled Banner culminate this week with an amazing array of reenactments, displays, living history, parades and the Blue Angels. 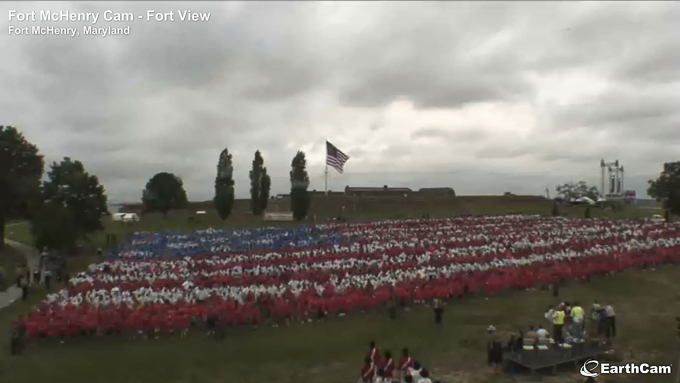 As I complete this entry, thousands of primary and middle school students from across the state formed a huge living flag at Fort McHenry. The Star-Spangled Spectacular is in full swing. Blue Angels 9/13-14 - which means you can attend our workshops and still make the shows! Are you photographing events this weekend? Send an email to info@4riversphoto.com if you want to find shooting buddies. We'll do our best to connect you. We'll be out there, too. As always, please share this entry with friends, family and photographers everywhere. Baltimore's Kick-off to the commemoration of the War of 1812. 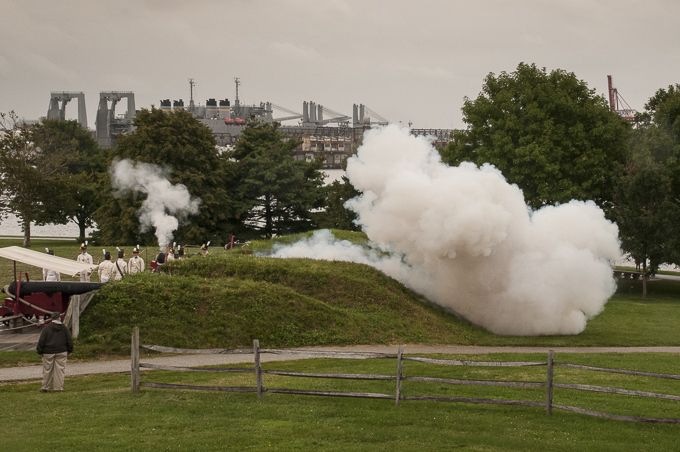 The defense of Fort McHenry took place in 1814. Take from Baltimore's Word Trade Center. 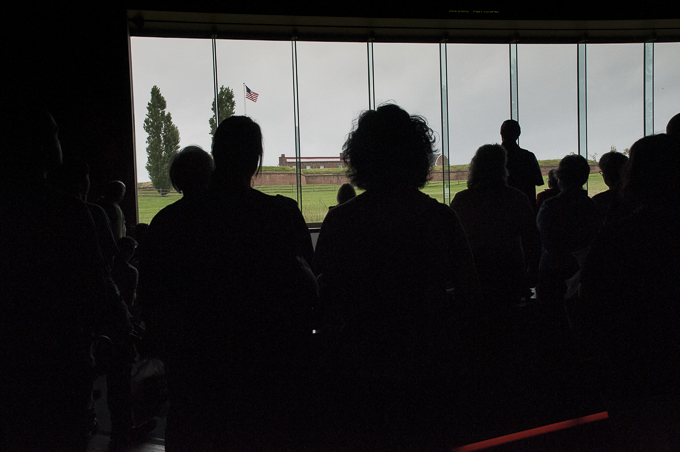 Visitors to Fort McHenry have the opportunity to participate in unfurling a large 15 Star and 15 Stripe replica flag. It is an informative and moving experience. We stood together with fellow Marylanders and with visitors from across the country in the increasing rain and learned of the Battle of Baltimore. As the flag grew wet and heavy, I thought of what it must have been like to man this fort under the 25 hour bombardment of missiles, mortars and bombs through the night-long heavy rain. Ranger Ray Snyder did an excellent job of involving the group and making history come alive. Visit Fort McHenry if you can. The visitor's center movie is a must. Then tour the fort. Stand on the ramparts. Turn east toward the Chesapeake Bay. Imagine looking into the teeth of the amassed armament being thrown up by the British Fleet. It's well worth the trip. Laurie grew up in the Annapolis area enjoying all that its rivers, woods, historic setting and strong community provide. After earning undergraduate and graduate degrees in Biology, she returned home to the banks of the Severn River. An early career as a biologist for The Johns Hopkins University soon transitioned to positions in the emerging field of Information Technology. Laurie designed and taught countless computer application courses and developed strong programming, data analysis and management skills. Through it all, Laurie captured her love of nature, landscape and animal portraiture - especially birds in photography. Her photographs are featured in Field Guide on Insects of the Cloud Forest, author Paul Beck, Illustrator Ryan Hobson; the Museum of Nature & Science in Dallas, TX; the Cornell Lab of Ornithology's website All About Birds; and the travel website Schmap.com. Her awards include Best in Show and several category prizes in the 2011 Canaan Valley National Wildlife Refuge, Friends of the 500th Annual Annual Competition; Honorable Mention in the Nature Conservancy's 5th Annual Photography contest and several exhibition awards from the Digital Photography Club of Annapolis. Photograph the Super Moon August 10, 2014. Tips and camera settings for obtaining best results. The September 9, 2014 Super Moon and Perceid Meteor Shower are also discussed. Four Rivers Photo announces two new learning opportunities; the return of our Butterfly Workshop and a Lightroom Tutorial. Read all about these sessions. Shake off those winter blues! Here are some photo opportunities around Annapolis in the months of March and April. March in Maryland - Spring Is On Its Way! This month we offer suggestions for early spring photographic inspiration on the Chesapeake and bring you the latest news from Four Rivers Photo.